This week’s Homeschool Help topic is “What’s new in your homeschool curriculum?” For us, the biggest change this year will be in our homeschooling style. 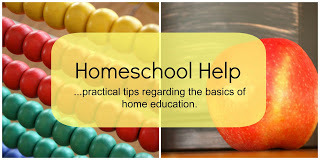 We’ve been moving in an increasingly interest-led direction ever since we began homeschooling. In fact, next year I’m declaring us almost-unschoolers. “Almost,” because I still find it useful to think in terms of school subjects when I’m strewing and suggesting ideas. In practice, our homeschool won’t look much different. The key for me is a shift in mindset. Until now, my ideas for what we should be doing with our “school” time have taken priority. 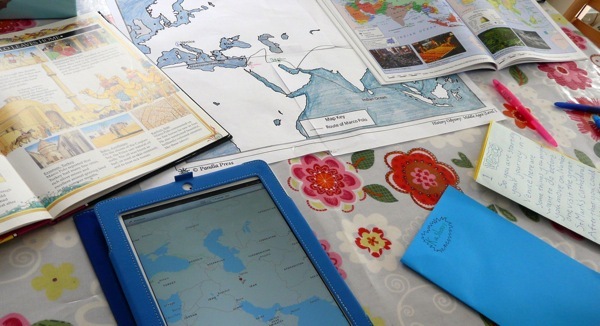 I have declared our school day started, and although my kids have loads of latitude, their plans have had to be fitted around our (my) routine. Next term I intend to flip that around. We’ll still have a routine, but it will be fitted around what the children want to learn. And I’m hoping that the boundaries between what is and isn’t “school time” will blur. After the success of our living maths experiment last term, we’ll be continuing to do our own thing with maths. Several of these we’ve already read, but we’ll explore the maths in greater detail. Well be doing lots of hands-on maths like All Things Beautiful‘s co-ordinate graphing, and Highhill Homeschool’s density experiments. And we’ll be playing with manipulatives like tangrams, pattern blocks, geoboards, and geometry instruments. This summer I’m taking Jo Boaler’s free Stanford University course How To Learn Math. The course is reminding me how important it is for students to tackle open, challenging problems and have the opportunity to make mistakes. Maths literature is a great source of open and challenging problems. I pre-read a book and talk about the problem with the children. We then read the book together later, but only after they’ve had plenty of time to work on their own solutions. 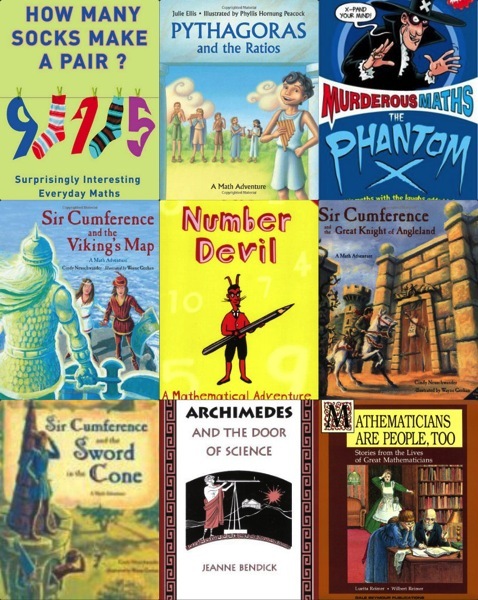 We’ll also use problems from maths websites, the Murderous Maths series, and books by Rob Eastaway and Edward Zaccaro. We began last year using grammar and spelling books. The children politely played along for a while, but our little forays into structure are always short-lived. English is definitely a subject we do best unschooling with a relaxed routine. Copywork and dictation – Copywork and dictation provide great handwriting, spelling, punctuation and grammar practice. Both children choose their own copywork. 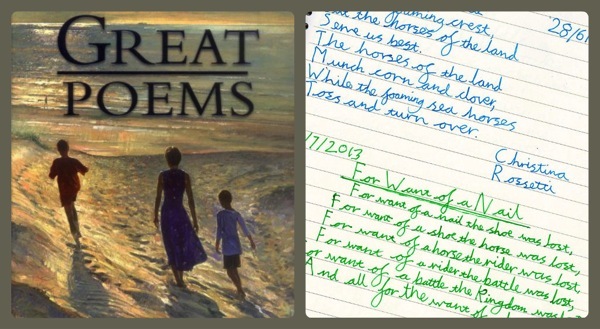 Freewriting – all three of us freewrite together. The only “rule” is to keep the pen moving until the timer beeps. Sometimes we use the same writing prompt, other times we follow our individual inspiration. Poetry Teatime – whenever I bake, we gather the poetry books, light a candle, and read poetry around the table. Creative writing coaching – C(9) works on her creative writing with an experienced home-educating mum friend who has helped her own children write using Brave Writer ideas. These coaching sessions (and email exchanges) give C(9) a dedicated space to develop her writing style and improve her revision and editing skills. C(9) loves the sessions, and when she gets an email from Gaynor, we see C(9) dashing up to her room with pen and paper, her iPad and a timer. Reading – Both C(9) and J(8) love reading and listening to books. I let them read whatever they want to, and offer plenty of suggestions. I choose audiobooks from Audible (with the children’s input) and they choose others from the library. I’ll continue to offer Toe By Toe to help with J(8)’s mild dyslexia, but if he doesn’t want to do it on a particular day, I won’t insist. There were days last year when he became frustrated to the point of tears with these sessions, and nothing is worth that. Writing practice – Both children have their own blogs (J(8) dictates his). They also practice writing and grammar during games like Consequences and Mad Libs. We’ll continue with our hands-on approach to science, with me offering “invitations to experiment” like those we did last year. We’ll also continue nature Study at our local pond. And I’ll be sure to make time for any scientific enquiries the children express an interest in. I love doing art alongside the children. Next year I expect we’ll continue to do art projects from 52 Art Labs for Kids. 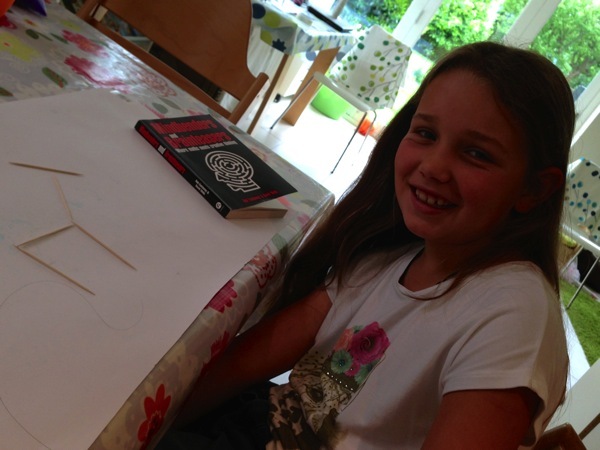 C(9) often takes inspiration from Art Attack (books or TV programmes). I’d like to find more art ideas to inspire J(8) – perhaps involving Mario or Minecraft. Ideas welcome! Last year we read the first half of The Story of the World, Volume 2. We only covered half the book because we took so many wonderful tangents. It was so liberating to realise we didn’t have to cover it all in one year! Next term we’ll continue where we left off (right in the middle of Marco Polo’s travels). In keeping with my unschooling mindset, I’ll offer SOTW as a read-aloud and make suggestions for related activities, but I’ll be guided by the children’s interest and busyness with their own activities as to how and when we fit it in. French – both children take a weekly class with a native French teacher. Latin – C(9) enjoys using Minimus: Starting Out in Latin.